Amputation is the act of cutting off a part of the human body, sometimes because of medical reasons. 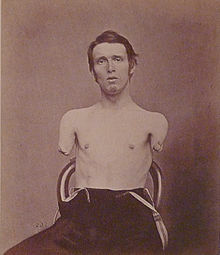 In some countries, amputation of the hands, feet or other body parts was used as a form of punishment for people who committed crimes. A person who has had an arm or leg removed is known as an amputee. This page was last changed on 6 June 2015, at 13:21.